September and October are two of the best months for outdoor eating and drinking in New York. The temperature cools down, the air is brisk, and the clouds are dramatic. Enjoy the last bits of warm weather at these five FED recommended al fresco places. 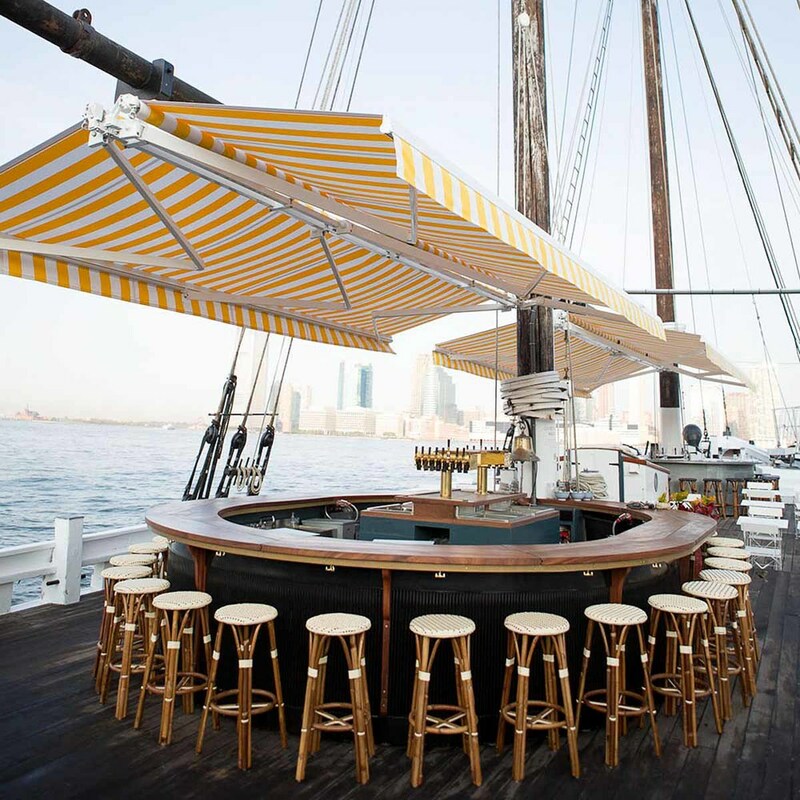 Eat oysters, drink craft cocktails, and sip wine aboard the historic wooden schooner, the Sherman Zwicker. Docked just off the Westside Highway at Pier 25 in Tribeca, this 142-foot oyster fishing boat never leaves the dock and stays open until midnight, so you can stop by anytime. Co-owned by FED Pro Mark Firth of The Prairie Whale in Great Barrington and formerly of Diner, Roman's, and Marlow and Sons in Brooklyn. Grand Banks | Photo Credit: Find. Eat. Drink. Terroir at the Porch | Photo Credit: Find. Eat. Drink. Sommelier Joe Campanale (Anfora, dell’anima, L’Artusi, L’Apicio) calls Paul Grieco’s beloved wine bar Terroir his favorite. In the warm months, they open up a full-service outdoor café overlooking the Hudson River on the High Line. Come to watch the sunset and drink wine or beer and dine on small plate dishes. Now in its 8th year, this is not your standard issue pop-up food court. You’ll find nearly 30 vendors, including many FED pros like Roberta’s pizza, Momofuku Milk Bar’s sweets and treats, lobster rolls from the Red Hook Lobster Pound, and ice cream sandwiches from Melt. This is a floating lobster shack on the Hudson River recommended by chef John Wells of Fung Tu. The boat is docked at Pier 81 and they take you on free sailing cruises throughout the day. Drink cold beer from buckets, cocktails from mason jars and eat lots of seafood from their raw bar. Red Hook Ballpark Food Trucks | Photo Credit: Find. Eat. Drink. Recommended by Susan Povich of Red Hook Lobster Pound, you'll find food trucks surrounding the Red Hook ballfields and serving made-to-order street from from El Salvador, Columbia, Chile, Mexico and Guatemala.